German au pair Christian taking in a beautiful view of the Verrazano Bridge in NY with his host child. My host family is very happy with me and if I could speak for them, I would say that it was the best decision to bring an au pair into the family. Now, I have been in the U.S. for 7 months. I’m living with a single mom and one child. I had the luck to meet them in my home city of Berlin, because they have been on vacation there. Therefore it was already possible to show them a piece of my culture and the historical background of Berlin. In the time in which I now live with my host family, I’ve tried several things to introduce my culture. I cooked German meals, for example Bratwurst (special sausages) with potatoes and mixed vegetables, potatoes with cottage cheese, various salads and other delicious food. At Christmas I got a big package from my parents from Germany. They put a lot of traditional cakes, cookies, candies and decorations for Christmas in the package. I shared them with my host family, because I wanted to show them how we celebrate Christmas in Germany. I enjoy spending time with my host child. We try as often as possible to do sports, because we both love sports. Soccer is the national sport in my country and therefore I am teaching him a few soccer tricks. Of course, we are playing other sports like basketball, baseball and football. My kid is a smart boy and is also inquisitive, thus he often asks me if he could learn a few German words. I am teaching him a couple of words which he could use in his everyday life. Now he has already collected a lot of vocabulary, which he has been writing on small cards. Music is closely connected to the culture of a country that’s why I also showed him some German songs from famous bands and translated the lyrics for him so that he understands what it is about. The job as an au pair deals with the meeting of different cultures and this is one reason why many families decided to take au pairs. On the one hand, the host families provide the au pairs with a way to get to know their culture and on the other hand, parents and especially the children learn more about different cultures, customs, habits and languages from all over the world. Moreover, the children become cosmopolitan and expand their general knowledge. 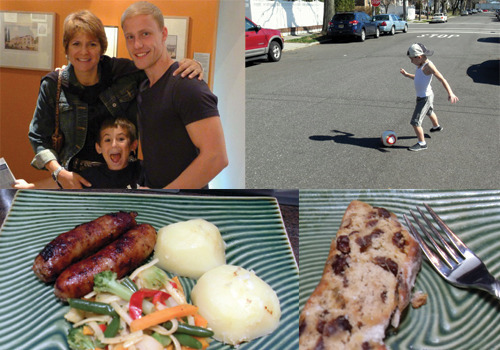 Christian was also kind enough to share his recipe for Bratwurst…YUM! Thank you Christian for sharing your cultural experience with the Buzz readers. We hope all au pairs are able to enjoy teaching their host families things about their home country!